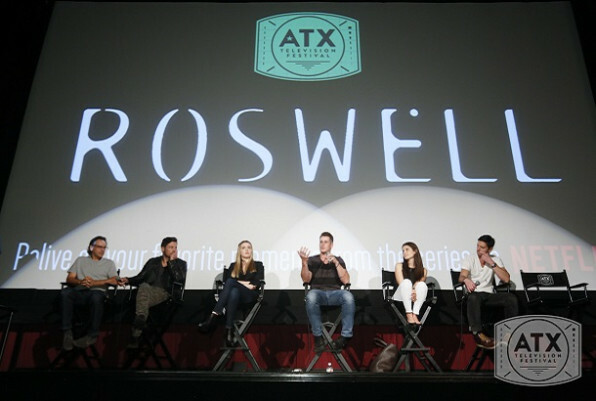 With a line around the block, Roswell fans proved their devotion to The WB cult science fiction show, created by Jason Katims (who would later go on to create cult football hit Friday Night Lights), on the final day of the ATX Television Festival. After 15 years, stars Shiri Appleby, Jason Behr, Majandra Delfino, Brendan Fehr and Nick Wechsler along with Katims were reunited to talk about all the longing looks, teen angst and alien drama that enraptured fans everywhere. Everygirl Liz Parker’s (Appleby) dramatic tale of being shot and then brought back to life by hunky, brooding alien Max (Behr) was complete dream fodder for teen girls everywhere. Couple that with a one-liner slinging sassy best friend Maria (Delfino) and other attractive brooding teen aliens Isabel (Katherine Heigl) and Michael (Fehr) AND Liz’s boyfriend Kyle (Wechsler) it was a fantasy world. The time for the actors was a formative one as well—Fehr, Behr and Delfino were relatively new on the acting scene. Fehr joked that Behr’s “acting notebook” he carried around intimidated him. “That’s a REAL actor.” Behr was attracted to the role of Max because of his complete emotional honesty, especially towards Liz, who for acting veteran Appleby (who has been onscreen since a very young age) was her first leading role. Appleby looks back at Liz and the Roswell experience with complete fondness. I think I was so excited to have a real character, something to grasp onto. I was at the same age, excited about falling in love for the first time, sort of feeling a little uncomfortable with myself. Jason’s writing is so good, it was so easy to sink into it emotionally — every script I would get that was his, it felt like a really well-written fit for me… I look back on this character and this time with so much fondness. The whole panel was ripe with tidbits for superfans—that Fehr originally auditioned for Max, Behr cringes over his early aughts hair and Delfino thinks that Maria would have some baby aliens now. After moderator Ben Blacker reminded the audience to make the final Q&A question really great, the chosen fan explained that she had traveled from very far away to make the panel and then uttered “Do you guys believe in aliens?” Some of the audience audibly groaned but others thought the voice sounded oddly familiar. As everyone shuffled out of the theater, rumors swirled that the Roswell superfan was none other than pint-size Jersey Shore reality star Snooki. Lo and behold, the currently flame-headed star posed for some pictures with fans but wouldn’t talk to press. However, she did respond to Appleby’s tweet asking if she was still in Austin. Glad to see that Snooks is just as a big fan as the rest of us. ATX Television Festival: Welcome Back to Everwood!